Brining is probably a term many hear during Thanksgiving. Essentially, it's when meat is marinated in salty water before cooking. Taking the time to brine meats makes a big difference. It tenderizes the meat and adds some flavor too. When it comes to stuffing foods, be it pastas, calzones or even meats like pork chops, I found that fillings can be used interchangeably. In this case, the combination of blue cheese, roasted red peppers and spinach is a favorite of mine that I used even to top pizzas. 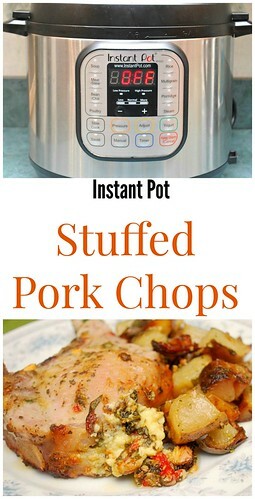 I knew it would work just as well stuffed in pork chops. Preparing this in my Instant Pot sealed the moisture and flavor in, resulting in a great and easy weeknight meal. 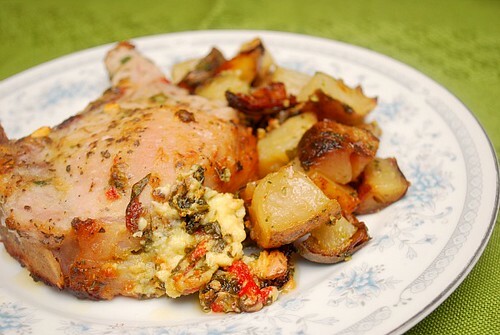 To serve with my pork chops, I oven roasted potatoes with a garlic & herb butter. Insert sharp paring or boning knife through side of chop until tip touches bone. Carefully cut opening to width of about 1 inch. Swing knife tip through chop to create pocket, being careful not to widen opening. Turn knife and swing blade in oppposite direction. The finished pocket should be as large as possible. Dissolve sugar and 1/4 cup salt in 6 cups water in large bowl or container; submerge chops, cover with plastic wrap, and refrigerate for 1 hour. To make the stuffing, in a bowl, combine the ingredients until fully incorporated; set aside. Remove chops from brine and rinse under cool running water; pat dry with paper towels. Place one-quarter of stuffing in pocket of each chop. Sprinkle chops with salt and pepper. Press SAUTE on the IP and add oil and butter; heat until shimmering. Arrange chops in IP and cook without moving chops until well browned, about 3 minutes. Using tongs, flip chops and cook until well browned on second side, 2 to 3 minutes longer. Add 1 cup of chicken broth or water to the IP. Using tongs, transfer chops to a platter, tent loosely with foil, and let rest 10 minutes (internal temperature will climb to 165 degrees). Serve immediately.